We’ve been homeschooling for 16 years. Over those years, we’ve home schooled through a lot of seasons – new babies in the house, a move, teen boys, financial squeezes and our daughter’s mono. Those required some shifts but nothing like the cataclysmic dive we experienced after Dan’s death. I had mixed emotions about homeschooling after Dan died. On one hand, I was very grateful that we could even continue to home school and grateful for the cocoon that homeschooling provided to talk and grieve and process such a deep loss together. At the same time, though, I had zero desire to teach. I could have cared less about math or declensions or world events. Anyone who has gone through grief or depression knows that it steals your passions as energy and emotion go toward healing. By God’s mercy, we’ve continued to home school and slowly, slowly, many routines have returned. I’m sure some will be forever different. Most days now, it feels good to feel good again. 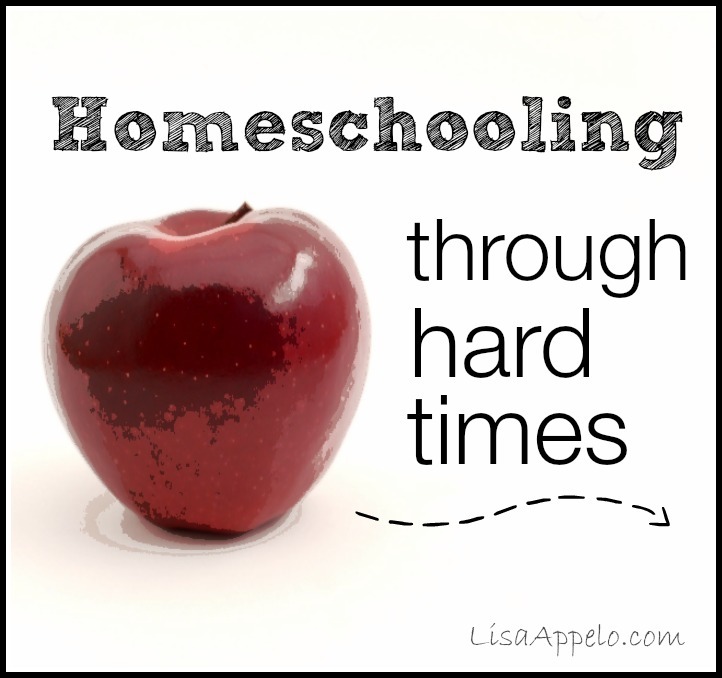 I want to share six things that helped us to continue homeschooling through the hard times. This is huge. Give yourself and your children an extra measure of grace. Schooling at home is going to look different in the hard times. Your planning will be different, the hours you school may be different and your children’s output may look different. You will probably need to set aside that ideal school on paper and find a schedule and curriculum that works in this season. Do not berate yourself as teacher or parent for needing to do the practical rather than the philosophically ideal. Don’t add mom guilt onto emotions already brewing in the hard season. What would you tell a good friend in your shoes? You’d probably give her a huge hug and kind encouragement. Give yourself and your children the same grace you’d give that friend. I’m sure that goes without saying, but being a very practical girl, I look for very practical help from the Lord. That first year, I was overwhelmed with way too much to do and I’m pretty sure I started every single morning asking God to order my steps. When you are pressed by demands that overtake your day and crowd out solid homeschooling, ask God to order your steps. God will not only allow you to accomplish the priorities, but give you peace to let the rest go. Also – and this is critical – ask one or two friends to pray specifically for your homeschooling. Friends often want to know how they can help when we’re going through difficulty. And you can only use so many casseroles! So ask your friends to pray. Give them a specific prayer need, such as a specific child or your morning math time, and ask them to pray daily for that need. Even as I write this, I remember the two friends that committed to pray for our homeschooling after Dan died and are surely a huge part of what kept us going. This is time to scale back and put your energy into the fundamentals. We gave priority to Bible, math and language arts. Beginning Latin for my first grader went out the window. My highschoolers (those not dual-enrolled) worked on five core classes: math, science, history, Latin and literature. I chucked the formal logic program that I had done with my older kids with no regrets. This is also time to choose curriculum that is easy to implement. My 7th and 9th grade boys worked on physical science together using a program that had every single thing in one box. Every rubber band and every copper wire needed for the experiments was in the box. With my 9th grader leading, the boys read the lessons online, completed their lab books and worked on the experiments together. Science got done because they didn’t have to wait for me to teach it or buy the supplies. In fact, it actually went down as one of our favorite science years. Reading together was both a tool for healing and time to bond. As we snuggled on the couch or sat on pillows around the living room, reading together helped us start conversations about life and sovereignty, trust and God’s faithfulness. And with three teen boys, reading together prompted conversations that might otherwise have stayed buried. We read books that helped us heal and helped us answer some big questions. I also looked for books that would encourage us, about families that persevered through difficulty with joy and optimism. I still tend to choose these kinds of books for our family read alouds. This is a Charlotte Mason term that means giving your child time and space to pursue his own educational interests. On the really hard days, or days when you are particularly busy with caregiving or paperwork, let your child engage in masterly inactivity. In our house, this means the TV and electronics are off, but the child is free to read, discover, play, design, build, make, do, write, create. Art supplies, book shelves, game closets and hands-on manipulatives are freely available. On these days, I often set out the school work that my kids can do independently and then allow the rest of the day for masterly inactivity. This was the final key to helping us continue to home school in that first critical year after Dan’s death. My older kids were dual-enrolled at our local college and university. My 9th grader took Latin II online. And all of them had several classes in a co-op we’d been a part of for years. Those classes gave us structure and accountability, while outsourcing some of my teaching responsibility. We are now three years out from Dan’s death and I finally feel like I have some of the enthusiasm of the early years. We’ve added back in some extras and I’m busy shoring up a couple of areas that need attention. I’m grateful for home school’s flexibility, that we slogged through the hardest years and for another year with these kids. Another great article Lisa! Keep up the good work! So many good things in this post! Very reasonable, very wise. I am glad you and your family are doing better. Your children are blessed to have such a mom. Thank you Lindsey. Never would have dreamed we would have to walk it, but God has been faithful. Lisa, I so enjoy reading your blog posts. I always learn from you and love how you bring me back to the important things in life, helping sift through to have the true priorities remaining as our primary focus. Love you. Praying for your sweet family! Lisa, as usual I love reading your wise, practical words you write from your experience. I miss hearing your words in person, so love keeping up with your writings. Wise words indeed! You’ve got me a little choked up over here =) Over the past few years (including one just this past week) I’ve had 3 different homeschooling friends/family members lose either a spouse or a child. I can’t begin to imagine what you all have gone through, but this post is wonderfully encouraging. I especially like your point about giving yourself grace!